California is earthquake country, and residents of Los Angeles can now get some critical warning, when conditions are right, after a quake has started and seismic waves are heading their way. 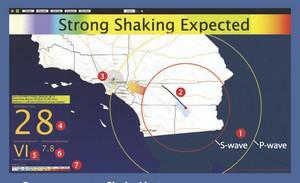 The long-delayed system, called ShakeAlertLA, is the first of its kind in the United States. Earthquake alert systems like this save lives, said Jeff Gorell, deputy Los Angeles mayor for public safety, as he demonstrated the application on his smartphone.